Objectives (1) To evaluate the prevalence of polypharmacy (5–9 medicines) and excessive polypharmacy (10+ medicines) and (2) to determine associated demographic and clinical characteristics in an ageing population with intellectual disabilities (IDs). Setting Wave One (2009/2010) of the Intellectual Disability Supplement to the Irish Longitudinal Study on Ageing (IDS-TILDA). Participants A nationally representative sample of 753 persons with ID, aged between 41 and 90 years. Participants/proxy reported medicines (prescription and over the counter) taken on a regular basis; medication data was available for 736 participants (98%). Main outcome measures/interventions Participants were divided into those with no polypharmacy (0–4 medicines), polypharmacy (5–9 medicines) and excessive polypharmacy (10+ medicines). Medication use patterns were analysed according to demographic variables and reported chronic conditions. A multinomial logistic regression model identified factors associated with polypharmacy (5–9 medicines) and excessive polypharmacy (≥10 medicines). Results Overall, 90% of participants reported use of medicines. Polypharmacy was observed in 31.5% of participants and excessive polypharmacy in 20.1%. Living in a residential institution, and reporting a mental health or neurological condition were strongly associated with polypharmacy and excessive polypharmacy after adjusting for confounders, but age or gender had no significant effect. Conclusions Polypharmacy was commonplace for older adults with ID and may be partly explained by the high prevalence of multimorbidity reported. Review of appropriateness of medication use is essential, as polypharmacy places ageing people with ID at risk of adverse effects. This is a comprehensive examination of the patterns and factors associated with polypharmacy and excessive polypharmacy in a representative older population with intellectual disability (ID). The use of the two thresholds for multiple medicine use (ie, polypharmacy and excessive polypharmacy) have not been utilised before in ID population, and the threshold of 10 or more indicates greater risk. The sample is representative of the national ID population in Ireland from which it was drawn meaning that these findings have the potential to be generalised to other populations with ID, and was sufficiently large that our multivariate analysis had sufficient power. The great majority of respondents recorded medication data (98%), and detailed collection of medication use allowed for accurate cross-sectional capture of medicines a participant was taking, including over-the-counter medicines. Participants and/or proxy respondents completed a detailed assessment of health characteristics, permitting examination of potential confounders in the regression model. While we cannot rule out other residual confounding, in our multivariate analysis we took into account demographic and other clinical potential confounders. Chronic conditions and medication use reported was based on participant or proxy self-report. However, the information gathered in the preinterview questionnaire (PIQ) was cross-checked at the time of interview and participants were given sufficient time before the PIQ was returned to gather the information. Such verification of information at the time of interview provides greater reliability than self-report recall methods alone. We do not know the extent to which answers in the face-to-face interview may have been influenced by the combination of responses styles. Those with severe or profound ID were more likely to have a proxy-only interview or a mixed answer style which enabled non-verbal participants, or those with severe ID to partake. Detection and diagnosis of illness are more complex for this population3 ,6 ,9 and may contribute to the overuse and underuse of medicines. Moreover, recent studies indicate differences in the severity and combinations of comorbid conditions in people with ID as they age.10 ,11 There is a high incidence in people with IDs of dual diagnosis: the co-occurrence of IDs and mental illness,12 with one study reporting 41% of adults with IDs with mental illness.13 Aggression, over activity, self-injurious behaviours or ‘challenging behaviours’ have been reported at rates of up to 60% in studies of people with IDs.14 ,15 Mental health and neurological concerns increases the likelihood of polypharmacy.16 Use of multiple drugs and long-term use of some types of drugs in this population may cause preventable harm.12 ,17 This risk of harm and complexity of prescribing is compounded by age-related adversity risk and the presence of organic dysfunction associated with the ID which may lead to idiosyncratic responses, and increased sensitivity to drugs.18–20 In Ireland and in other developed countries, increasing emphasis on deinstitutionalisation and community integration also means greater utilisation of primary care services where there may not be specialist knowledge of the unique issues for people with IDs as they age. Limitation of polypharmacy and of psychotropic use has been encouraged as one of the core elements of ‘good physical health’ in older people with IDs.3 ,6 Polypharmacy has been identified as a key indicator of quality of healthcare for people with IDs, as polypharmacy may cause harm and require clinical attention in this population.17 However, studies relating to the patterns, prevalence and predictors of polypharmacy exposure in older adults with IDs are scarce.6 ,21 Given the potential for increased adverse consequences for people with IDs from multiple drug use and from frequent reliance on general population data and recommendations, it is important that there be studies of the patterns of drug use particular to people with ID. To identify demographic and clinical factors associated with polypharmacy and excessive polypharmacy in an ageing population with ID. Medicines were recorded by brand/generic name, including prescription and non-prescription, OTC, herbal and alternative medicines and food supplements, and where available, the dose and frequency. Medication data was then confirmed by the interviewers at the time of interview. Medicines and supplements were recorded using the WHO Anatomical Therapeutic Chemical Classification (ATC) classification code, International Non-Proprietary name (INN name), and brand name where available.24 Two pharmacists (MO and JP) independently reviewed the original hard copy preinterview questionnaires and confirmed entries into the dataset and classified all use of medications. Information on the duration or of the cost of prescription was not collected. We defined a food supplement according to the Directive 2002/46/EC of the European Parliament and of the Council, of 10 June 2002.26 Food supplements herbal medicines, and homeopathic medicines were excluded from the definition of a medicine. Rectal diazepam (N05BA01) and buccal midazolam (NO5CD08) were categorised as ‘medicines used to treat acute seizures’ as per their Summary of Product Characteristics indications. Lithium (N05AN01) was reclassified as a mood stabiliser. Prochlorperazine was included in the antiemetic/antinauseant grouping (A04), as sufficient dosing data was available to suggest that it was primarily being used in low doses (5–10 mg) as licensed for Meniere's syndrome or nausea and vomiting in Ireland rather than 75–100 mg indicated in psychosis. The primary outcome of interest (the dependent variable) was whether a participant was exposed to no polypharmacy, polypharmacy or excessive polypharmacy. Excessive polypharmacy (EPP): concurrent use of ten or more different drugs. Polypharmacy (PP): the use of five to nine drugs. No polypharmacy: taking four or less drugs (included those taking no medicines). 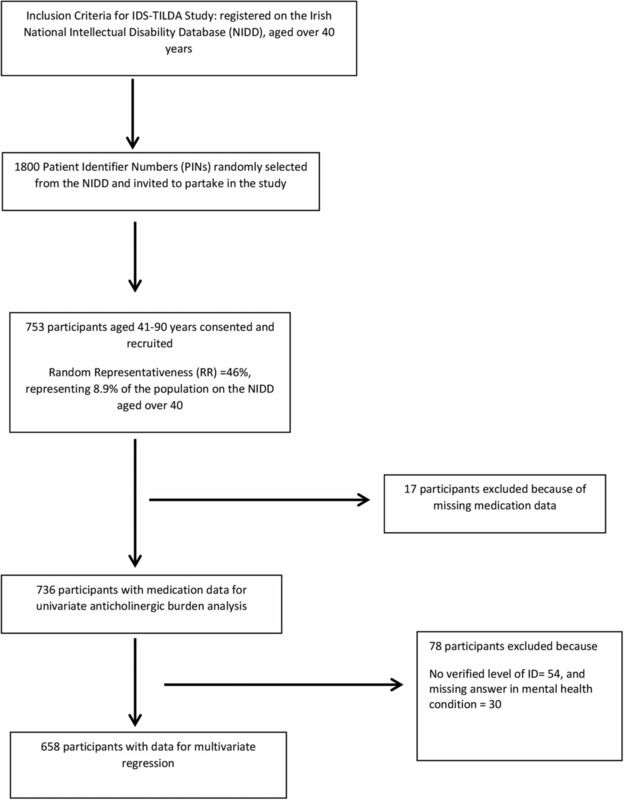 Each participant/caregiver respondent reported if the individual with ID had ever been diagnosed by a doctor/relevant health professional with one or more of 12 chronic health conditions.10 Multimorbidity was defined as the co-occurrence of two or more of these chronic health conditions in one person.30 For the purposes of further detailed analysis in our study, lung disease, liver disease, stroke and cancer were not included in further analysis, as each had a prevalence of <5% in the sample. Pain was measured using response to the question ‘Are you often troubled with pain?’ (n=714). Participants were asked in the preinterview questionnaire the number of occasions in the previous year they had accessed a range of primary, secondary and tertiary care services including GP, outpatient, accident and emergency (A&E) admissions and nights in hospital. Statistical analyses were carried out using the Statistical Package for Social Sciences, V.20.0 (SPSS Inc). The characteristics of the eligible sample were expressed as percentages, medians with SDs (±SD) and 95% CIs. The overall prevalence of no polypharmacy, polypharmacy and excessive polypharmacy exposure was calculated as a proportion of the total eligible population (n=736). A χ2 test for independence at univariate level was used to test for a significant association between the three polypharmacy groupings. For continuous variables, a one-way analysis of variance (ANOVA) was used to test for a significant difference. Univariate analysis was initially used to examine associations between the dependant (polypharmacy exposure) and explanatory variables. Multinomial logistic regression was performed to identify clinical and demographic factors associated with polypharmacy and excessive polypharmacy exposure. In this model, the outcome (dependent) variable had three possible outcomes and the individuals who reported no polypharmacy exposure (0–4 medicines) were the reference category. All demographic variables were included in the multivariate model (age, gender, level of ID). Those who lived independently or in community group homes were included as a single variable, as the subpopulation of those reporting excessive polypharmacy in the independent setting was small (n=5). Only those with verified ID (n=682) were included in regression analyses. Clinical variables with a significance of p<0.10 at bivariate level were selected for inclusion in the multivariate model (this p value was selected so that important or influential factors were not omitted). Multicollinearity between independent variables was examined using a variance inflation factor (VIF), >2 being the cut-off.31 All fell below the specified threshold. Variables were entered into the multivariate model simultaneously. Results are presented as ORs with corresponding 95% CIs. Interpretation of the results for a specific risk factor is based on the odds of being, for example, exposed to excessive polypharmacy rather than being exposed to no polypharmacy. Significance is assumed at p value <0.05. Sample size calculation for the logistic regression was based on the guideline of Peduzzi et al;32 for a minimum number of cases (N) needed for the study; N=10k/p, where p is the smallest of the proportions of negative or positive cases in the population, k the number of covariates (independent variables) and k/p is the number of events per variable (EPV). For our regression model, there were 12 covariates and the proportion of negative cases (excessive polypharmacy) was 0.215, therefore a minimum sample size (N) of 558 was needed. There were 653 cases available for regression analyses, so sample size was sufficient. Table 1 includes details of the demographic and clinical characteristics of the eligible sample with medication data (n=736). Mean age of participants was 54.1 years (SD 8.8, range 41–90 years), with almost half (45.7%) aged between 50 and 64 years. Almost half (46%) with recorded level of ID (n=682) reported moderate ID. The four most frequently reported chronic conditions were: eye (51.3%), mental health (47.7%), neurological (36.3%, of which 30.7% had epilepsy) and gastrointestinal (26.7%), with 71% reporting multimorbidity. Almost all (92.4%; 680), reported taking one or more medicines, with a maximum of 19, a mean (±SD) of 5.7 (±4.4) medicines. Of this, almost a half (46.3%) took fewer than five drugs with polypharmacy (32.2%), more common than excessive polypharmacy (21.5%). Gender was not an association but excessive polypharmacy increased with age. The level of ID was significantly associated (p<0.001, n=682) with polypharmacy and excessive polypharmacy; 47.3% of those with polypharmacy had severe/profound ID and almost one-third (29.3%) of those with severe/profound ID reported excessive polypharmacy (table 2). In contrast, <5% of those living independently reported excessive polypharmacy (p<0.001, n=736). The frequency of prescribing corresponded to the frequency of reported chronic conditions (table 3). Six of the most frequently reported therapeutic classes were drugs for mental health conditions and epilepsy (table 3). Almost two-thirds (64.6%) of the excessive polypharmacy group and over half (54.9%) of those with polypharmacy reported one or more antipsychotics, compared with 26% with no polypharmacy. Antiepileptics were the second most frequently reported class (39%) and represented 63.1% of the excessive polypharmacy, 54% of the polypharmacy but only 16.7% of the no polypharmacy groups. Of the 287 participants who reported antiepileptic medications, 71.4% (205) reported a diagnosis of epilepsy while the majority of the other 82 participants (n=65; 78.8%) had a doctor's diagnosis of an emotional/nervous or psychiatric condition. The increase in use of a drug class across the groups was greatest for anxiolytics with 16 times as many users in the excessive polypharmacy group compared with the no polypharmacy group. This contrasted with only 2.5 times as many reporting an antipsychotic, emphasising the high usage across all groups and the reported prevalence of mental ill health. Laxatives (75.3%) and drugs for peptic ulcer disease (PUD)/gastro-oesophageal reflux disease (GORD) (49%) were frequently reported by the excessive polypharmacy group but were reported by only 12.3% and 8.8%, respectively, of the no polypharmacy group. Proton pump inhibitors were the principal drugs in this group reported by 21.7% of all participants and 44.5% of those in the excessive polypharmacy group. Of the sample, 43% reported that constipation was a problem, and almost one-fifth reported a doctor's diagnosis of chronic constipation. Lipid modifying agents (25.4%) were the most frequently reported cardiovascular agents with a notably lower reported use of other cardiovascular agents; antithrombotics (10.6%), agents acting on the renin–angiotensin system (6.5%). Thyroid disease and drugs were frequently reported and varied little across the groups and were around threefold greater than the number reporting diabetes and receiving antidiabetic drugs. Of those who answered the question (714), 334 reported experiencing pain. Of the analgesics reported, paracetamol was most frequently used; 34.2% overall, with infrequent use of more potent analgesics—2.3% of reporting use of paracetamol/codeine combinations, and 0.8% reporting use of opioids. Non-steroidal anti-inflammatory drugs (NSAIDs) were less frequently used—oral and topical—by 9.9% of participants. Eye conditions were the most commonly reported conditions in the cohort, with half of participants reporting an eye condition.10 Prevalence of use of eye preparations was low; 2.8% reported lubricant preparations (ATC S01X), and 1.1% reported antiglaucoma and miotic preparations and 2.8% (10) a diagnosis of glaucoma. Results from the multinomial logistic regression are presented in table 4. Living in a residential institution, and reporting having a mental health, neurological, endocrine condition or hypertension were each independently associated with polypharmacy and excessive polypharmacy exposure at both levels, controlling for all other factors in the model. Those with severe/profound ID were likely to be exposed to polypharmacy, but not excessive polypharmacy. Gastrointestinal disease was significantly associated with excessive polypharmacy only. Gender, age, eye conditions, heart disease or joint disease were not significantly associated with polypharmacy or excessive polypharmacy. 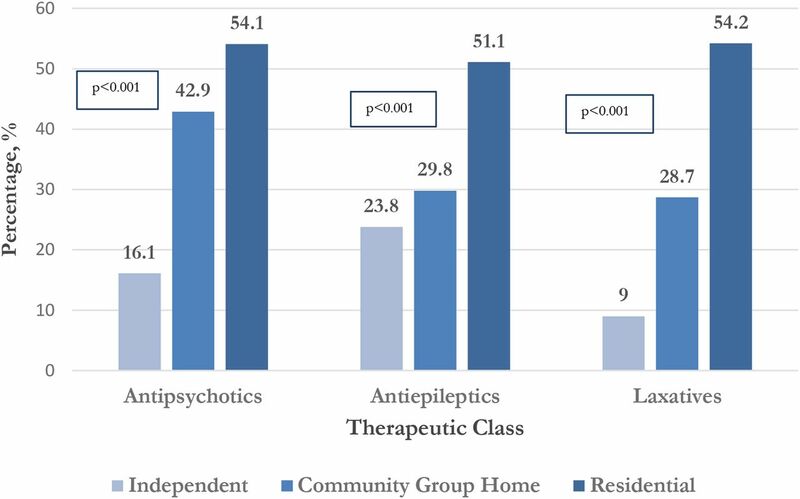 A greater proportion of participants living in residential institutions reported use of antipsychotics, antiepileptics and laxatives compared to those living independently or in community group homes (p<0.001) (figure 2). Proportion of participants receiving three most frequently reported therapeutic classes according to residential status (n=736). Intraclass polypharmacy was observed in the three most frequent therapeutic classes; of those who reported antipsychotics (319), one-quarter (25.7%) received antipsychotic polytherapy and 39.7% (n=114) of those with antiepileptic drug (AED) use reported antiepileptic polytherapy while almost half, 47% (n=130), of those with laxative use reported laxative polytherapy. Of those reporting laxative polytherapy, half (50.8%) reported a doctor's diagnosis of chronic constipation. There was a significant bivariate association (p<0.001), between the number of GP consultations and outpatient visits in the previous year and polypharmacy status (table 5). Over 40% of the sample reported six or more GP consultations in the previous year. Similarly, nearly 30% of the excessive polypharmacy group spent one or more nights in hospital compared with <8% of those with no polypharmacy (p=0.002). Almost everyone in this cohort of people with ID of 40 years and older were taking medicines—polypharmacy was the norm and excessive polypharmacy was common. The burden of multimorbidity was also high with participants reporting a mean of 2.5 chronic conditions. However, after adjusting for confounding factors, it was those with mental health conditions, gastrointestinal conditions, neurological conditions, endocrine disease and hypertension that were more likely to be exposed to polypharmacy and excessive polypharmacy, whereas neither age nor gender had any significant influence. Corresponding to this, we found a high prevalence of agents used to treat epilepsy, mental health and gastrointestinal conditions, and a substantial but lesser use of drugs for thyroid disease. Use of analgesics, particularly paracetamol, was common and similarly the prevalence of pain was associated with polypharmacy and excessive polypharmacy. More frequent healthcare utilisation, with the exception of Emergency Department visits, was also associated with the degree of polypharmacy. Notably, we identified that the only association between polypharmacy status and the level of ID was between those with severe/profound ID and polypharmacy alone, whereas, by contrast, those living in residential institutions were more likely to be exposed to polypharmacy and excessive polypharmacy independently of other factors. In parallel, there was also an increasing gradient of use of antipsychotics, antiepileptics and laxatives with an increasing degree of supervision. Moreover, intraclass polypharmacy was only notable among the three most frequently prescribed therapeutic groups; antispychotics, antieplieptics and laxatives. This study has a number of key strengths. First, it is a comprehensive examination of the patterns and factors associated with polypharmacy and excessive polypharmacy in a representative older population with ID. The use of the two thresholds for multiple medicine use (ie, polypharmacy and excessive polypharmacy) have not been utilised before in ID population and the threshold of 10 or more indicates greater risk.33 ,34 The sample benefits from the representativeness of the national ID population in Ireland from which it was drawn meaning that these findings have the potential to be generalised to other populations with ID, and was sufficiently large that our multivariate analysis had sufficient power. The great majority of respondents recorded medication data (98%), and detailed collection of medication use allowed for accurate cross-sectional capture of medicines a participant was taking, including over-the-counter medicines. Participants and/or proxy respondents completed a detailed assessment of health characteristics, permitting examination of potential confounders in the regression model. While we cannot rule out other residual confounding, in our multivariate analysis we took into account demographic and other clinical potential confounders. In so far as they are comparable, the results of this study are similar to those of two other recent ID cohorts.36 ,37 In Australia, in 2008, a survey of 897 people with ID in the state of Victoria aged from 18–82 years, a community dwelling population with ID who had used health services and reported that 27.8% of those over 40 years of age and 41.7% of the over 60s used over five medicines,36 while in Canada, in 2009, among 52 404 adults aged 18–64 years with developmental disabilities using the Ontario Disability Support Group, 37.1% of those aged 45–54 years and 42.1% of those aged 55–64 years received five or more medicines.37 In our study, those living independently or in community group homes are probably most similar to these cohorts and the prevalence of polypharmacy among the two subgroups combined was 35.1%. Multivariate analysis revealed that place of residence was associated with polypharmacy exposure, with those living in residential institutions being much more likely to be exposed to polypharmacy and excessive polypharmacy. These findings are consistent with several studies in the ID population where greater medicine use, in particular, psychotropic drug use has been reported in institutional settings;16 ,48 however, unlike the present study demographic and clinical variables were not controlled for in those analyses. Furthermore, we also found that severe/profound ID was associated only with polypharmacy and not excessive polypharmacy while other studies have reported contrasting36 and similar findings.49 Since a greater proportion of those with severe ID live in residential care, this was unexpected and raises the possibility that the influence of the institution on the provision of care is substantial. Each of the three most frequently recorded drug groups, antipsychotics, antiepileptics and laxatives, were all more frequently reported by those in residential, as compared to community group homes or those living independently. Vetrano et al50 found that 16.9% of elderly, cognitively impaired nursing home residents from seven European countries were exposed to excessive polypharmacy with laxatives, proton pump inhibitors and antipsychotics among the most frequently prescribed drugs. The influence of place of residence on the degree and pattern of medication use is of particular relevance in Ireland, as there are renewed efforts to move people with ID from institutional settings into the community51 and as the quality of care of people with ID and of those without ID in residential facilities appears to vary markedly despite the existence of quality standards.52 It will be important to follow the trends in polypharmacy over time to see if greater community placement is associated with decreased levels of polypharmacy. Patterns of multimorbidity comprising mental health and gastrointestinal conditions, epilepsy, endocrine disease, pain and hypertension did appear to drive the high level of drug use noted. Mental health and epilepsy were the strongest and most consistent predictors, while gastrointestinal conditions were associated with excessive polypharmacy only and endocrine disease and hypertension although less prevalent, but were also associated with both levels of polypharmacy. Ouellette-Kuntz reported that comorbid psychiatric diagnoses resulted in multiple medicines at a greater frequency; however, this was at univariate level only, and adjustments for confounding variables were not made.37 Haider et al36 collected information on a limited range of conditions that excluded mental health other than depression and pain and thyroid disease, their analysis showed that stroke, cancer, epilepsy, osteoporosis and diabetes, but not depression were significantly associated with polypharmacy in adults. Eye disease was the most commonly reported condition in the cohort, with half of participants reporting eye disease. Of those reporting eye disease, 27.2% (98) reported having cataracts, 5% (18) reported age-related macular degeneration and 2.8% (10) reported glaucoma. There were a wide range of other eye conditions reported including blepharitis, hypermetropia and bilateral keratoconus. However, reported prevalence of eye preparations was low; 2.8% reported lubricant preparations, 1.1% antiglaucoma and miotic preparations. This was reflected in lower excessive polypharmacy and polypharmacy exposure in those with eye conditions; 29.2% were exposed to excessive polypharmacy, 29.2% polypharmacy and 69.7% of those with eye conditions had no polypharmacy. Other studies in groups with IDs have also found that antipsychotics and antiepileptics were the most frequently used therapeutic classes.37 ,41 ,47 Antipsychotics were the most frequently reported class, confirming results of previous studies in populations with ID.16 ,49 ,53 ,54 The levels of reported use of antipsychotics were higher for those who reported excessive polypharmacy, with two thirds reporting use. The widespread use of these agents for mental health conditions and behavioural problems (5) requires further evaluation since there are several risk factors associated with long-term use including weight gain, glucose dysregulation and hyperlipidaemia in the case of the second-generation agents,55 ,56 and extrapyramidal symptoms and cognitive decline in the case of the first-generation agents.18 People with ID may be more susceptible to these side effects compared to the general population57 and the prevalence of use is also much lower with estimates of 1.2% (6) and 2% (7) in older people in Ireland. Antiepileptics were the second most commonly reported class (40%) in our sample and 7 in 10 of those also reported a doctor's diagnosis of epilepsy. It is likely that in some cases these agents were used for their mood stabilising indications. Anticonvulsants were identified as the second most common class of repeat prescriptions issued to people with ID receiving general practitioner services in the Netherlands.41 The rate of use in our study was higher than reported in previous studies, where prevalences of 8% and 26% has been reported37 ,47 but less than reported by van Der Heide et al58 among an institutionalised population with profound and multiple disability in the Netherlands. Difficulties were encountered making direct comparisons with regard to medicine use in this population compared with other populations with IDs, as definitions of polypharmacy often did not capture total load of medicines in other studies identified. More studies of patterns and prevalence of multiple medicines use in the IDs population are needed, encompassing the broader definitions of polypharmacy and excessive polypharmacy employed in the general population, particularly as life span continues to improve for people with IDs and they acquire age-related morbidities. Findings in this study identified that multiple medicine use was much greater for people with IDs compared to the Irish population over 50. Furthermore, a different pattern of multiple medicine use for older people with IDs was identified, with greater use of agents to treat mental health and neurological conditions compared to the general population. Therefore, use of appropriateness tools that are used in the elderly have limited applicability to this population. There is a need for specific prescribing guidelines for ageing with IDs, including medication recommendations for particular disease clusters that commonly co-occur in this population. These guidelines would be particularly important to be directed at non-specialist clinicians and pharmacists to aid screening so that appropriate referrals for more specialist treatments can then be made if appropriate. With deinstitutionalisation, people with ID and complex comorbidities are now living in community settings and accessing non-specialist primary care services at greater frequency. The longitudinal data from Wave Two will transform the study from a cross-sectional analysis into a cohort study and will provide a comprehensive insight into resultant changes in medication patterns as people age, and move into community settings and will enable us to examine the effect of medication use on clinical outcomes. Our findings suggest that a significant proportion of ageing people with IDs are exposed to polypharmacy and excessive polypharmacy to treat multiple morbidities. Furthermore, the distinct patterns of multimorbidity in this population create particular challenges for care providers; those with mental health conditions and epilepsy were more likely to be receiving excessive polypharmacy and in addition, intraclass polypharmacy was associated with antipsychotics, antiepileptics and laxatives, and the place of residence. In contrast, pain, although prevalent was not associated with intensive pharmacotherapy. This study has begun a process to identify at-risk groups, raise awareness of the unique challenges in providing appropriate pharmacotherapy to this population, and in consequence highlights the need for frequent and rigorous monitoring. This could be achieved through collaborative medication reviews with the incorporation of a clinical pharmacist to help improve the quality of prescribing and patient care.64 This is particularly important, as ageing people with IDs represent a growing cohort who are particularly vulnerable to adverse drug events, and further work needs to evaluate how this can be provided in the different settings in which older people with IDs live. The IDS-TILDA study is funded by the Health Research Board and the Department of Health and Children. The lead author (MO) received funding for a PhD from the Trinity College Dublin Studentship. The funding body did not play a role in the study design, writing of the manuscript. The corresponding author (MO) had full access to the study data, and had final responsibility to submit for publication. The authors would like to thank the people with ID who participated in this study, their families, the services involved, the IDS-TILDA Scientific Advisory Committee, and the Intellectual Disability Consultative Groups for their support. They would like to acknowledge the contributions of Dr Kathleen Bennett and Dr Rachael Carroll. The authors would also like to acknowledge funding for the IDS-TILDA study from the Health Research Board (HRB) and the Department of Health.
. Self-injurious behavior in intellectual disabilities. Access Online via Elsevier, 2007.
. Report on the State of Science on Health Risks and Ageing in People with Intellectual Disabilities. IASSID Special Interest Research Group on Ageing and Intellectual Disabilities/Faculty Rehabilitation Sciences, University of Dortmund, 2009.
. Health inequalities and people with learning disabilities in the UK: 2010. Durham: Improving Health & Lives: Learning Disabilities Observatory, 2010.
. Meeting the end of life needs of older adults with intellectual disabilities. Contemporary and Innovafive Pracfice in Palliafive Care, 2012:255–70.
. Diagnostic Manual-Intellectual Disability (DM-ID): a textbook of diagnosis of mental disorders in persons with intellectual disability. NADD, 2007. ., Colloquium on Guidelines for the Primary Health Care of Adults with Developmental Disabilities. Primary care of adults with developmental disabilities Canadian consensus guidelines. Can Fam Physician 2011;57:541–53.
. Growing Older with an Intellectual Disability in Ireland 2011: First Results from the Intellectual Disability Supplement of The Irish Longitudinal Study on Ageing School of Nursing, Trinity College Dublin. 2011. Anatomical Therapeutic Chemical Classification System. http//www.whocc.no/atc-ddd-index/ (accessed 26 Mar 2013).
. Polypharmacy in adults over 50 in Ireland: Opportunities for Cost Saving and Improved Healthcare. The Irish Longitudinal Study on Ageing, Lincoln Place, Trinity College Dublin, Dublin 2, 2012.
. Applied linear regression models. McGraw-Hill/Irwin, 2004.
. Investigating the prevalence and causes of prescribing errors in general practice. London: The General Medical Council: PRACtICe Study, 2012.
. The effect of misclassification in the presence of covariates. Am J Epidemiol 1980;112:564–9.
. Health problems of people with intellectual disabilities: the impact for general practice. Br J Gen Pract 2007;57:64–6. Report of the Working Group on Congregated Settings Homes. Time to Move on from Congregated Settings: A strategy for Community Inclusion. Health Service Executive, 2011. Inclusion Ireland. A working paper on the first 50 Health Information andQuality Authority (Hiqa) inspections of residential services or people with disabilities, 2015.
. The influence of environment, predisposing, enabling and need variables on personal health choices of adults with intellectual disability. 2013. Contributors MO, MCH, JP, PM and MM contributed to the overall conception and design of the study. MO and JP undertook the data extraction. MO carried out the statistical analyses of the study; wrote the first draft of this manuscript. MO and MCH revised the manuscript.All authors, external and internal, had full access to all of the data (including statistical reports and tables) in the study and can take responsibility for the integrity of the data and the accuracy of the data analysis. All authors contributed to the interpretation of results and drafting of this manuscript. All authors read and approved the final manuscript.The views expressed are those of the authors and are not necessarily those of the Department of Health, the Health Research Board or Trinity College Dublin. MO and MM are the guarantors. Funding The IDS-TILDA study is funded by the Health Research Board and the Department of Health. The lead author (MO) received funding for a PhD from the Trinity College Dublin Studentship. The funding body did not play a role in the study design, writing of the manuscript. Ethics approval Ethical approval for the IDS-TILDA study was granted by the Faculty of Health Sciences Ethics Committee, and 138 Intellectual Disability Service Providers.